My guess is that most people walk right over my favorite maps in Seattle. There are at least 14 of them that I can find, though there were originally 19 in the city. Excuse the pun, but the maps are in the most pedestrian place possible, on manhole—though now the PC term is hatch cover (apparently no one cottoned on to peoplehole)—covers throughout downtown. The idea for Seattle’s hatch cover art began in 1975 after Seattle Arts Commissioner Jacquetta Blanchett had traveled to Florence and seen the city’s hatch art. Working with Department of Community Development director, Paul Schell, Blanchett donated enough money to fund 13 covers, with six more paid for by other donors. Each cost $200 and weighed 230 pounds. The first one was put in place in April 1977, on the north edge of Occidental Park. It is still there. Anne Knight designed the map. A map was natural because Seattle had such a “graphically interesting street pattern,” she said. Anne thought that the map covers would make an excellent teaching guide, as well as a guide to the city. If you look at covers (except one), you will see there is no compass. A City of Light employee had told Anne that one thing he didn’t want was a compass on the map. Otherwise, the crews would have to orient the cover correctly each time. So there is no compass, though there is a map, which one would hope wouldn’t be too challenging for the City of Light crews to orient. Apparently it is. Despite Anne including a small welded bead on the outer ring of each cover to facilitate easy alignment, nearly all of the covers are misaligned at present. In addition, Anne included a raised, polished bead indicating the location of the cover within the city. They can still be seen on the maps. The images are fairly large so might be a bit slow to load. Anne told me that a police officer had heard about the project and called her to say he was concerned that pedestrians would be stopping in the middle of the street to look at the maps. She told him not to worry as she had only chosen spots on corners. Each of the maps includes city landmarks, such as the post office, the Seattle Public Library, King Street Station, and Denny Park. You can figure out which one is which by looking at the key on the map’s outer edge. All of the landmarks still remain except for the Kingdome. “At the time it had just been built and I thought naively that it looked like it was a structure that would be there forever,” Anne said. As you can see from the accompanying annotated map, not all of the original 19 covers exist. I could locate only 13, plus the later one added on Second Avenue. 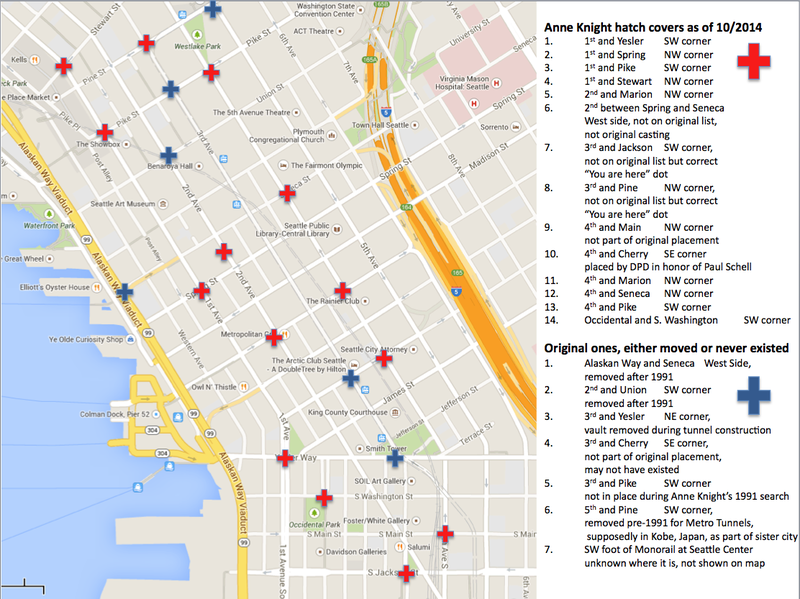 Neither Anne nor the City of Seattle Office of Arts & Cultural, which administers the city’s hatchcover design process and which supplied me a list of the original locations, knows the present location of all of the maps. (The hatchcovers are administered by Seattle City Light. I have yet to find out if they know the location of the covers.) One is now in Kobe. 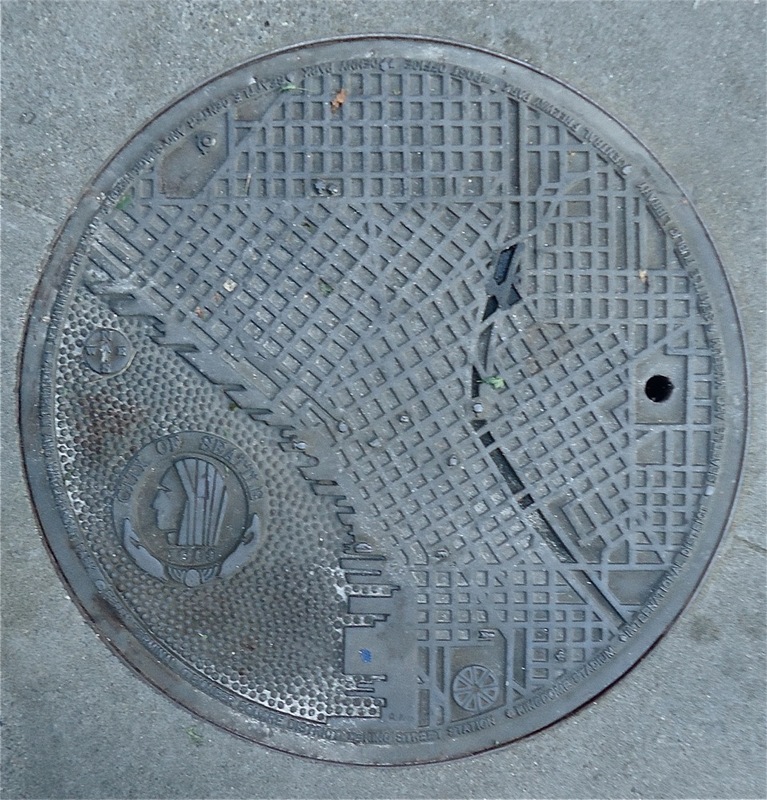 (This one had been moved to an alley and a City of Light employee had removed it and happened to have it in his truck when he attended a sister city meeting and suggested sending the cover to Kobe.) Several others have been moved and/or removed with their whereabouts unknown. One that was on the original list apparently was never in that location and there might be one at the Seattle Center, which was moved during reconstruction of the Monorail, but I haven’t found it. 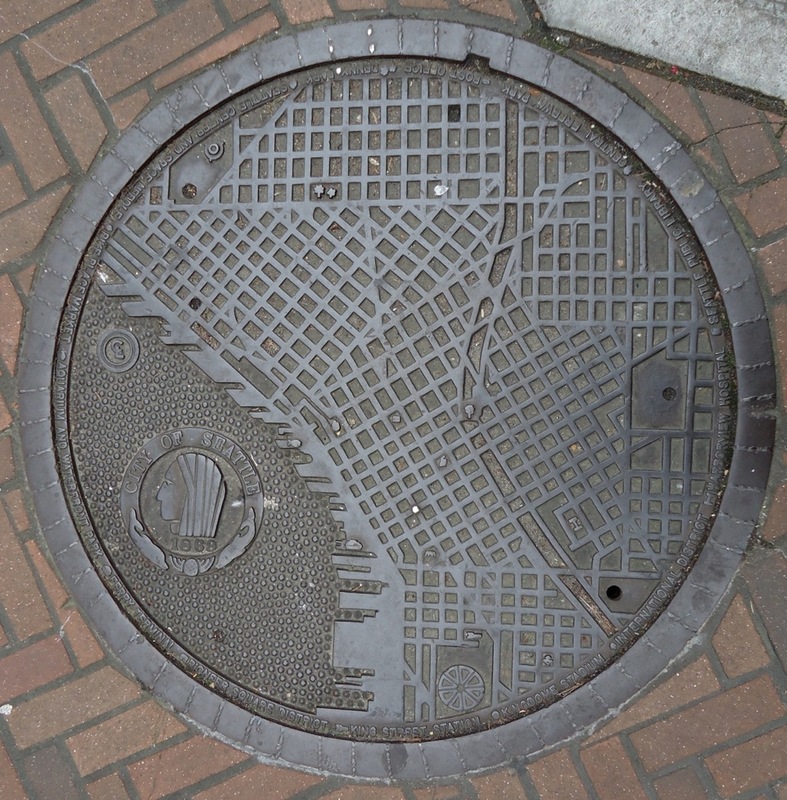 These manhole maps are one of the delights of Seattle. So next time you are out walking around downtown, take a look down at your feet. You might be amazed at what you find.